One of our go to brownie recipes is Smitten Kitchen’s “my favorite brownies” – it’s super easy and quick to make! Sometimes you want a rich sweet chocolatey bite. But sometimes – you want something to snack on, or something for your kids to grab after school, but not necessarily so heavy and decadent that it would spoil dinner! I am becoming a huge fan of dates because they add such a lovely sweetness to recipes (like in banana bread!) without being cloyingly sweet. pureeing the dates, hi baby! 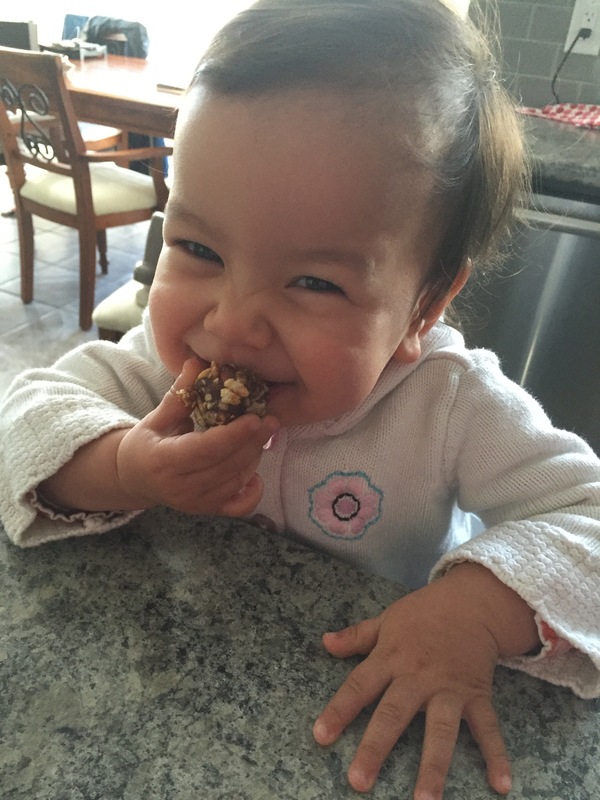 My little 8-week champ was pretty chill this morning so I had some time to play around in the kitchen, and here’s what came about – a brownie recipe that uses dates and coconut oil instead of white sugar and butter, baking up into a guilt-free brownie that I’m hoping the kiddos will love after school. If you tend to need more sweetness, I would recommend using a different chocolate (maybe 60% or semi sweet chocolate). I’m digging these with a cup of tea, but I know my kids would enjoy it even more a touch sweeter. Prepare a baking dish 8×8″ by buttering it generously or lining with parchment paper. If you’re lining it with parchment, leave the ends long so that the brownie lifts out easily once it’s cooled – and butter the sides that do not have parchment. Preheat oven to 350 F.
Place dates in a bowl and cover with hot water (I used my kettle) – let it sit while you do the next steps. Melt chocolate and coconut oil together using a double boiler method (in a heat proof bowl over a saucepan with gentle simmering water). Remove water from dates (you don’t have to drain it completely dry) – then puree in a food processor until pretty smooth. In a large bowl, combine melted chocolate with dates, mixing well (stand mixer with paddle attachment or use a hand mixer). Add eggs and vanilla – beat, then scrape down the bowl and beat again, incorporating everything evenly. Add flour and mix just until incorporated, using a spatula to finish (do not over mix). Pour mixture into prepared baking dish and place in your preheated oven, middle rack, for about 15-18 minutes. It is ready when a toothpick comes out clean (a little underdone is okay because it continues to bake a little when you take it out of the oven). Once it is cooled, you can remove it easily by lifting the parchment paper edges. Cut into squares and enjoy! So I am officially a huge date fan now and remember that huge bag of pressed dates I had kicking around in the pantry?…Well it is gone and I had to buy pitted dates this time (I couldn’t find the pressed ones) and the 1kg container is at it’s half life already! 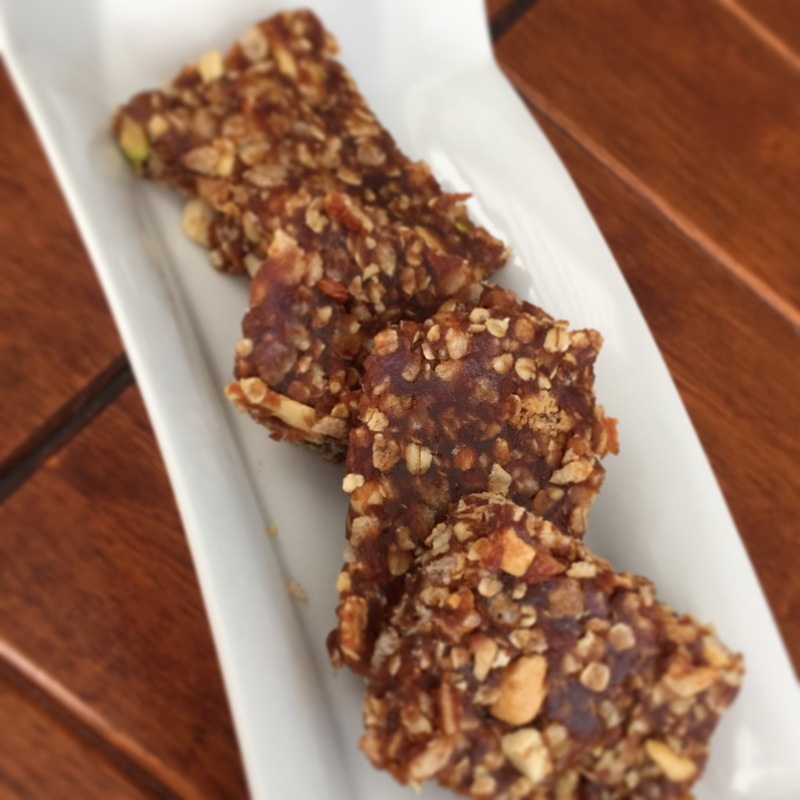 These are very similar to the previous post crispy oat, nut & date bars but they have a hint of peanut butter in them (which means less butter butter! ), less sugar and lots of almond & pumpkin seed goodness. Definitely experiment your favourite seeds & nuts – and the measurements don’t have to be exact but be careful to add them slowly to the date mixture because the important part is to be sure there is enough date ratio so the ball holds together well. These are a household favourite now and my kids just love them! They are a great snack to keep in your purse (they snacked on them this morning at the grocery store) with minimal mess! *If your seeds and/or nuts are salted – you don’t need to add salt to the recipe. In a food processor, pulse almonds until quite fine (you can keep it chunkier but it tends to stick better in the ball if it’s smaller). Remove. In the same processor, pulse pumpkin seeds. Add to almond mixture and combine. In the same processor, pulse the dates until it forms a ball going around and around – paste like. In a small pot on medium low, add dates, butter, peanut butter, cinnamon, salt and brown sugar – use a firm spatula or large fork to mash everything together, until evenly combined – then turn off the heat. Add vanilla and stir. Add about 3/4 of the seed and nut mixture to the date mixture – stir to combine – if it’s still quite sticky and date dominant – add the rest. Add the rice crispies as well – stir and either form balls or press into a 9×9″ square pan for squares. *if you are making balls – grease your fingertips a little bit with vegetable oil or butter so that they don’t stick to you. *if you are making squares – make sure they are completely cooled before you slice. a knife dipped in hot water will make the slicing easier. 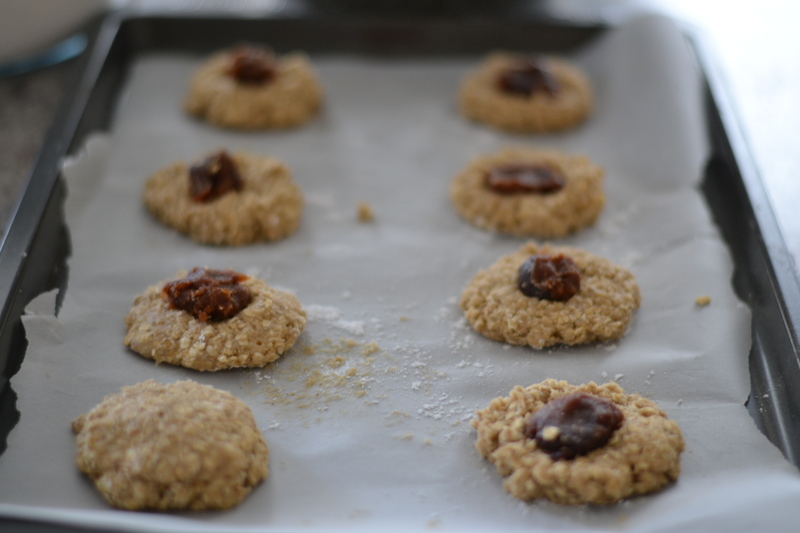 I have had a huge bag of pressed dates sitting in my pantry since my craze with baking date filled oatmeal cookies. I had a craving for the sweetness of dates but didn’t have the time commitment today to make the cookies – so pie pie and I experimented in the kitchen a little today while the boss was napping…and oh man these are actually amazing. They are so tasty I think if you had someone taste them blindfolded they might even think there is some sort of chocolate in there. Even as we were tasting them, I asked pie pie if she thought we made junk food or good food…and she looked at me with a cute sheepish smile and replied “junk food” and I reviewed our ingredients again with her and she said…”good food??!”. It is packed with nuts, dates, some oats and rice crispies, and for richness yes there is butter & brown sugar…but not lots. My husband came home from work and popped one into his mouth and then said “mmm..what is this? is it bad for you?” and pie pie happily told him “no! it’s good food!” hahaha, after which he proceeded to eat a few more. If you or your family are like us (sweet tooths!) then this recipe is a must try! You could certainly eliminate the brown sugar too if you prefer, as the dates are quite sweet. Oh – and just realized – they are gluten free, for those who can’t eat wheat! In a saucepan over medium-low heat, combine dates, brown sugar, cinnamon and butter. Once butter is melted and dates are loosened, remove from heat and mix with a fork to work butter and sugar into the dates. Add in the rest of the ingredients and mix using fork or spatula, until everything seems evenly combined. Press firmly into a 9×9″ pan and allow to cool completely before cutting into squares and storing in an airtight container. Instead of squares you could roll them into balls (also a fun task for kids) – don’t be scared to press them in your hands firmly to make sure they stay together in a ball form. Enjoy! boss woke up from her nap to a healthy fun snack! golden brown and crisp on the outside, warm and tender on the inside…yum! So awhile ago my mother in law had purchased date sandwich cookies from a little bakery near her cottage and pie pie just loved them and told grandma how yummy they were. Then she began to tell me how those cookies reminded her of her own childhood; her grandmother used to make these amazing cookies that had a soft interior that was filled with dates…the way she described the cookie and her memory of it made me crave dates and cookies even though typically, I never really think of dates because I don’t like date squares! Ever since I heard this story I have always wanted to try to make something maybe can come somewhat close to that memory filled cookie. It always amazes me how food creates such a memorable experience and connects us to the people we love, forever. 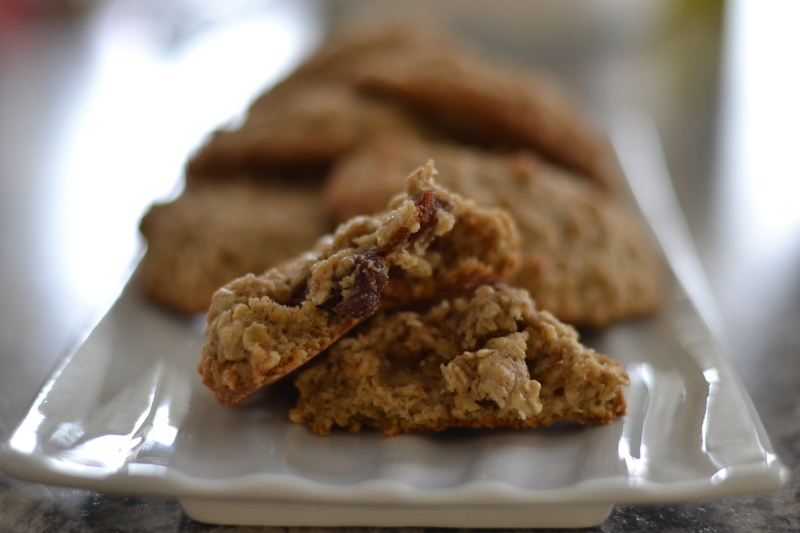 Here is my version of an oatmeal cookie with a date surprise in the middle. The cookie is just sweet enough itself but the addition of the soft gooey date in the centre makes for a special treat. The recipe only makes about 12 so if you’re feeding a crowd be sure to double it! Hope you like these Sue! Line baking sheets with parchment paper and preheat oven to 350 F.
Combine flour, salt, baking soda, cinnamon in a medium bowl. In a large bowl, beat sugar and butter until very smooth and fluffy. Add egg and vanilla, beat well. Add dry ingredients to butter mixture, mix until just incorporated. 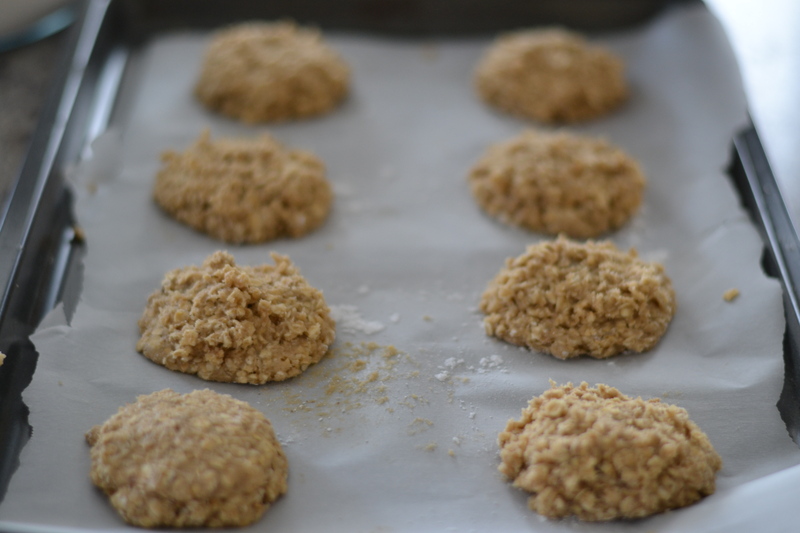 Add rolled oats and mix until a sticky dough forms, don’t over mix. Using your hands (you have to get a little messy for this!) – form little balls of dough then press onto lined cookie sheet, about 6-8 cookies per sheet. If you have a little bit of vegetable oil or butter on your hands it will help prevent the dough from sticking to your hands. Press the centres down a bit to make a little hole for the dates to go in. bottom left cookie got topped up before the shot! Cover up the dates on each cookie with a little bit more dough -just to cover the date. It doesn’t have to be a tight seal because the dates will not ooze out as the cookies bake in the oven. Bake for 10 minutes in the middle rack. They are done when the outsides are slightly golden brown. Remove from oven and allow to cool just enough that you can transfer then to a cooling rack. 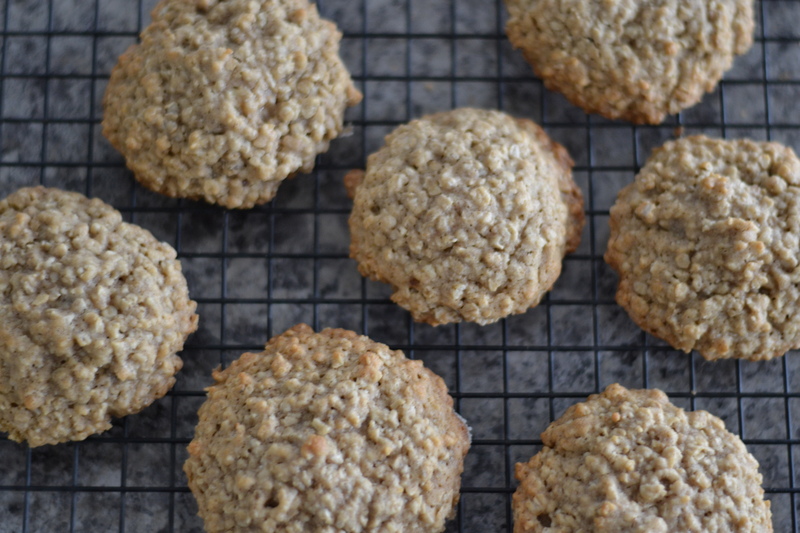 These cookies are SO good served warm, so if you can bake them right when you want to serve them that would be ideal! Enjoy!